Penalty World Challenge 2010 models the penalty shoot-out phase of a soccer game. I've played a few of these and found none that are any good on the Android and a couple good ones on the iPhone so this is a potentially welcome addition. Furthermore, this one goes a bit beyond what some of the other do in that you play on both offense AND defense. When taking a shot you'll first choose a pitch (the meter in the lower left) for your shot and then you will swipe to fire the ball at the net. On defense a pair of hands appears and you touch to move them and adjust where you'll dive to in an effort to deflect the shot. No instructions are given so it took me a few minutes to figure all of this out. God forbid instructions be provided. The game features two modes of play. It includes the usual 'Quick Shoot-out' as well as a 'World Challenge' mode. In World Challenge mode it's just like the World Cup with the assertion that you end every game in a tie and are forced to go to a shoot-out. You start off in a bracket of four teams and hopefully advance into a single elimination tournament and eventually emerge as the champion. The games graphics are pretty and colorful and the sound is sharp. All of the control is handled via the touch screen. I found clicking on the buttons to be a little less than responsive. There's also a delay when choosing a pitch. You can learn to compensate for the delay, but I'm not sure if it's supposed to be a challenge to get just the right angle or not. If it's the former (and I think it is) I'd much rather a faster bar move back and forth with instantaneous reaction to my touch. Finally, on defense there doesn't appear to be any opportunity to react to an opponent's shot. You have to move the hands BEFORE the ball is kicked solely having the opportunity to anticipate where your opponent will strike. When played I found that the game had an overall sluggish feel to it. I'm running on a Motorola Droid so perhaps this plays nice and smooth on the newer, higher powered devices. I'm also disappointed that a huge game like this does not support App2SD. At this point I think that's a mandatory feature for any game over a meg in size. I really like the World Challenge mode, but fear that skill levels are necessary. Without skill levels what incentive do I have to play again after winning it all? In conclusion, this is a game that is a disappointment for me. I was really hoping for a heavy reflex oriented shoot-out game. I was excited when the game gave me a chance to play goalie, too. Unfortunately, there's no chance to react to a shot. Rarely do I see goals get blocked. Often, even when the ball makes contact with the goalie it trickles on into the net. The only way to miss consistently is to shoot wide or high. I also would rather a replay not be shown after every, single shot. That makes the game feel like it drags. An option to turn replay mode off would be nice. 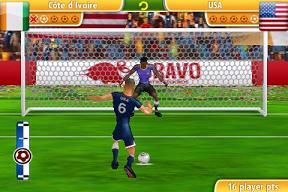 This is a game that could be fixed and made into a must have title for the soccer enthusiast. The core of the game is beautifully done! But until then that only makes it more of a tragedy that this game isn't more fun to play. 3.5/5 stars.